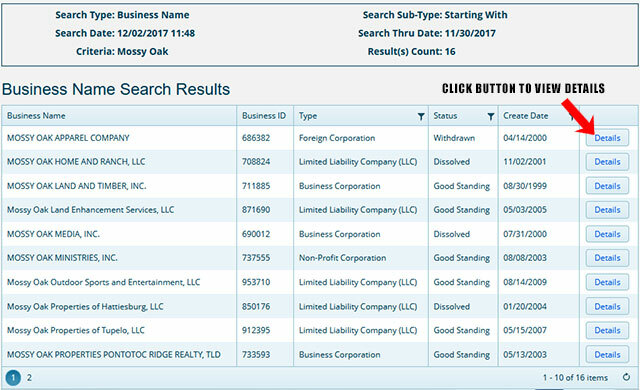 The business corporation registry is taken care of by the Business Services Division of the Secretary of State of Mississippi. The registry is the store house of all the chartered companies and businesses filed with the Mississippi Secretary of State. Entities like Corporations, Limited Liability Companies, Limited Companies, Limited Partnerships and Limited Liability Partnerships have their records stored in the business corporation registry of the Mississippi SOS. 1. The first step is to access the Mississippi business search page by clicking here. It looks similar to the screenshot below. 2. This form allows you to search for a business by its name, Business ID, Officer Name and Registered Agent. For this example, we will be searching by name so go ahead and click the "Business Name" tab. Under this tab you can widen or narrow your search by selecting one of the search criteria such as "Starting With", "All Words", "Any Words", ,"Sounds Like" or "Exact Match". For this example go ahead and select "Starting With". 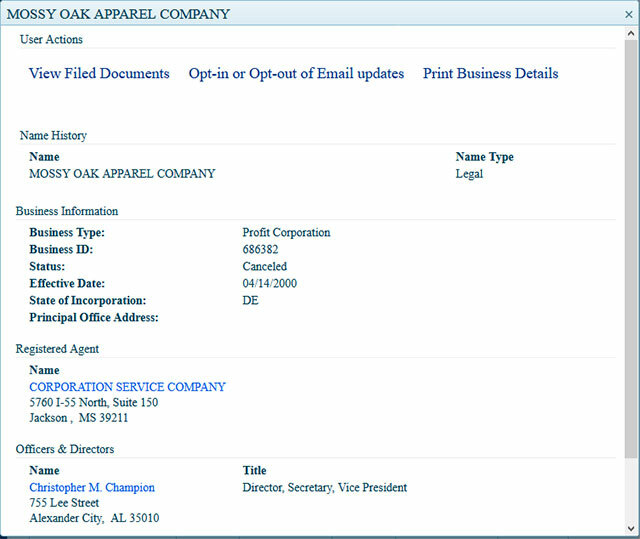 In the "Business Name" field type in "Mossy Oak" and then click the "Search" button. This is illustrated in the screenshot shown below. 3. Click on the Search button. The result page carrying the summarized details of the entity looks similar to the screenshot below. 3. On the results page click the "Details" button located next to the business entity you want to view the details for. When you click the button a pop-up window will show with the details for that business entity. In this pop-up window it shows their filing date, authorization date, status, type etc. 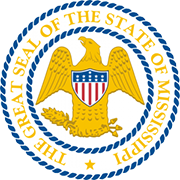 The Constitutional office of the Secretary of State Mississippi is one of the elected governmental office in the US state. The position originated under the Constitution of Mississippi and continues to be the guardian of the public of the state till today. The current office holder of the Secretary of State of Mississippi is Delbert Hosemann.